Irene Kate Patron/The Fordham Ram Phil Feinbusch tends the Rodrigue’s coffee couter as one of a dozen baristas who keep Rodrigue’s going. If you’re looking for a place to study, read or get your caffeine fix in preparation for a long night, Rodrigue’s Coffee House is open to all. Opened in 1991, Rodrigue’s Coffee House is the only on-campus club that provides a daily, tangible service to all members of the Fordham community through low-priced, organic and Fair-Trade coffee drinks as well as an open community space. 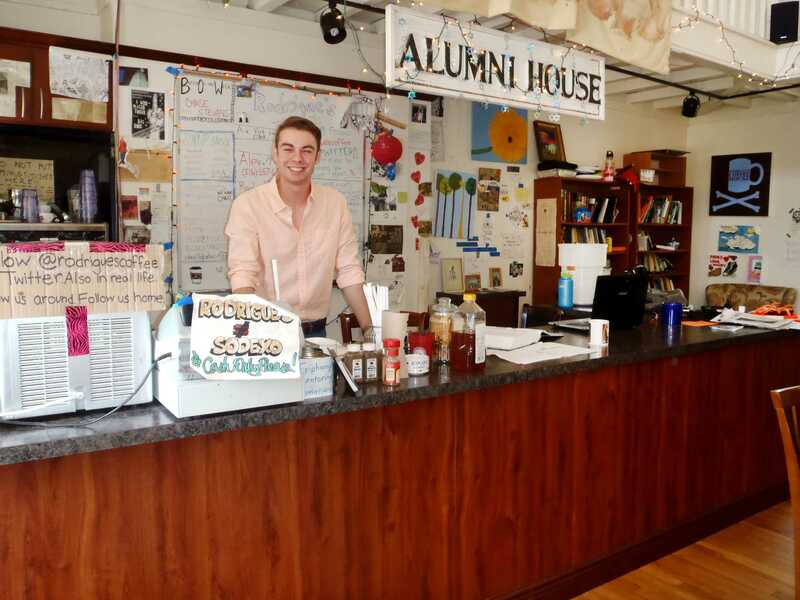 Located between Queen’s Court and Alumni Court South, Rodrigue’s Coffee House –sometimes referred to succinctly as “Rod’s”– is maintained entirely by volunteer student workers and headed by an elected executive board. Each member of the club must volunteer to work four hours a week in the coffee house and attend a weekly meeting on Sunday nights. Along with her other Co-President Alex Minikes, FCRH ‘14, Vice President Paul Ross, FCRH ’15, Secretary Sarah Champlin, FCRH ‘16, Treasurer Tom Geiser, GSB ’15, and Publicist Kaitlyn Flanagan, GSB ’15, the Rodrigue’s executive board ensures that the space is run efficiently and implements measures voted for by the general board of student workers. Those measures include the delegation of the semester budget and use of the space. Rodrigue’s Coffee House hosts a variety of events including open mics, poetry readings, film viewings and concerts, all of which are free for the Fordham community to attend. So far this semester, there have been two concerts and an open mic night, and for all three evenings the building was filled to capacity. Slated for later in the semester are even more concerts, more open mic nights, a monthly movie viewing for the Justice Film Series, professor lectures and even classes such as one taught this past week by freshman Dean Robert Parmach for Jogue’s freshmen. Sarah has felt so welcomed by the club that she now spends about five hours a day inside the building, as well as volunteering as a worker. Returning volunteer Tim Livingston, FCRH ’16, says he understands the thought that the people inside Rod’s are “unfriendly hipsters,” but he maintains that the worst thing about the club is the fallibility of the volunteers: “I’ve screwed up my fair share of iced cappuccinos,” Livingston said.